What can we learn from DIY libraries? By now I’m sure you’ve read about the spate of little, free libraries popping up all over the place; if you’re lucky, you may have even seen and used one. The idea is simple: volunteers build and install small book depositories in public spaces, inviting passers-by to take a book, leave a book, or both. 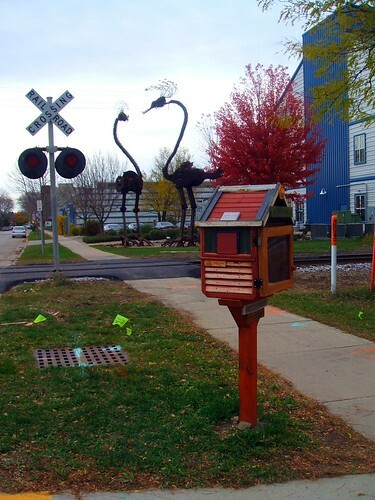 The Little Free Library Project of Madison, Wisconsin is one of the more successful projects, though a lot of attention is also given to urban hacking Department of Urban Betterment project in New York City. Wherever they find a home, these DIY libraries are rightly heralded as testaments to reading, sharing, and community. I think institutional libraries can learn a lot from these tiny upstarts. DIY libraries reinforce that libraries are social institutions, they fulfill needs that library theorists often ignore, and they provide an indirect commentary on the relationship between libraries and media. Here’s a short list of lessons that I think librarians can learn from the DIY library movement. 1. Librarians don’t define what a library is. Pretty much everyone associated with the DIY library movement is comfortable using the term “library.” However, I doubt most institutional librarians would be so comfortable, at least assuming the library literature/blogosphere reflects the interests of the “official” libraries. DIY libraries have no circulation policies, no collection development policies, no reference assistance, no substantive organization of information, no archival mission, no information literacy programming…you get the idea. Micro libraries retain almost nothing of the institutional library services and activities that we usually take to be the foundations of our field. Indeed, recent studies have shown that most people have no idea what libraries are even talking about. It all goes to show that, ultimately, a library is a social institution and the meaning of the concept “library” is fixed externally. 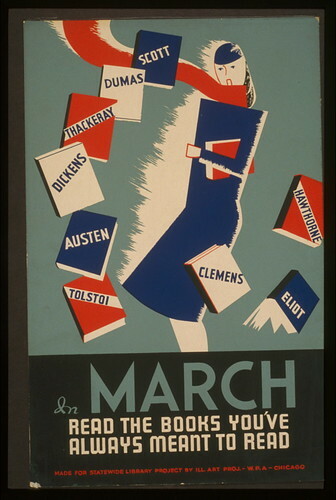 Librarians don’t decide what is or is not a library–a community decides. 2. Libraries aren’t just about knowledge and information. I suppose you could argue that we read Dostoevsky in order to gain knowledge about the human condition (or Dr. Seuss to gain knowledge about the merits of hopping on Pop), but it seems absurd to recast every work of fiction in terms of knowledge creation. The fact of the matter is that the mission of libraries is more than just “knowledge creation” or “access to information;” it’s also about the shared literary experience. Yes, truth, fact, and information are enormously important to libraries, and society has to a large extent entrusted institutional libraries with upholding certain democratic principles relating to knowledge. All I’m saying is that DIY libraries demonstrate that society has also entrusted libraries with cultural works. In particular, the micro libraries mostly share fiction, that is, the same fiction that drives public library circulation statistics and the battle over ebooks. Clearly, communities are not formed around DIY libraries because of social justice, empowerment, knowledge-seeking, or access to information; they are formed around the desire to share (and share in) stories. Yet, major library theorists like Lankes and Frey have (literally) nothing to say about the aesthetic and cultural value of literature or fiction in libraries. So, I think the DIY library is a nice reminder that knowledge creation is only part of what we do in libraries–it would be nice if our mission statements reflected that. 3. Printed books are still relevant. Here’s a thought experiment: take a bunch of librarians, put them online, and tell them to talk about books. Now, how many tweets will it take before the discussion turns to the differences between print and e-books? If you answered “three”, well, congratulations! Public librarians online and at conferences just love talking about ebooks. Yet, DIY libraries succeed precisely because they abandon the electronic option and deal straight-forwardly in printed books. I suppose someone is working on a kiosk with free ebooks available over wi-fi, but that misses the point of community building. Yes, digital stuff is great. But, print books are totems of written culture and they play an invaluable role in the way we bond as a group over the written word. Maybe it’s just a sort of print fetishism that leads people to lament digital solutions like ebooks or the Internet, but fetishism is still evidence of deep-seated conviction. 4. Libraries will always find a way. With all the doom and gloom over the future of institutional libraries it’s nice to see evidence that, come what may, libraries in some form will always find a way. Google can’t completely kill-off the library and no matter how pervasive social media becomes we will still want to gather in person in a physical place dedicated to a shared interest. Think of it like watching live music or visiting an art gallery (or, for many librarians, attending conferences). DIY libraries tap into the desire to freely gather around a shared passion for reading and/or learning. Of course, not every library patron is necessarily passionate about libraries. Full-sized, institutional libraries serve a lot of social and cultural functions, and they provide much needed services in their communities. A given patron might only want free Internet access or a 1040EZ and not give a damn about reading and learning. But, just as the heart of a museum isn’t the gift-shop, the heart of the library isn’t in providing free Internet access or tax forms. The heart of a library is in the social transcript and people’s desire to gather around it. That desire isn’t going away anytime soon and as long as we want to gather in person we’re going to have libraries. They might be entire buildings, single rooms, or even repurposed birdhouses. They may or may not have a trained, professional staff. I don’t know what will happen to librarians in the future, but I do know that the DIY libraries prove that libraries in some form are here to stay. So, there you have it: some stuff I think institutional libraries can learn from the DIY library movement. Just to reiterate, I’m not saying that DIY libraries are a replacement for institutional libraries. I’m not saying that librarians are unnecessary. Institutional libraries serve an essential purpose that should not be diminished and professional librarians are absolutely vital. All I’m trying to point out is that the DIY movement highlights certain social attitudes that libraries and librarians shouldn’t neglect. So, what do you think? Are tiny, do-it-yourself libraries “libraries” at all? Do they point to anything important about the library as a social institution? If you want to chime in, just write something in a moleskine and put it in a milk-crate on the corner. I’ll pick it up later. Just discovered your blog today, via Andromeda Yelton – had to take a look because I am a librarian married to a philosopher of language, and his colleagues have already made jokes about how we both think about “reference.” and here you are blogging about the Little Free Libraries in Mad City, where I live! I have to say that I think they are so successful in Madison not only for the reasons you outlined, but because this place has a highly developed sharing, trash-picking and public clutter culture. The free section of Craigslist is always good for a laugh (free trees! you cut!) and many cafes have small book sections too, or toys for kids to use. Not to mention “hippie Christmas,” the day when all the students move and leave their stuff for others to pick up. Having little houses full of books everywhere just feels normal, so much the better if they’re on the bike path, next to the artisanal pasta factory using only local foods:-B and yes, that’s the closest one to my house.